The Central Zone is all waters draining into the Columbia River from Bonneville Dam up to and including the Deschutes River. Angling for all species is restricted to artificial flies and lures in streams. See Exceptions where use of bait is allowed. A valid Columbia River Basin Endorsement must be in possession when fishing for salmon, steelhead, or sturgeon in the mainstem Columbia River from Buoy 10 upstream and in all the rivers and their tributaries that flow into the Columbia River. See Advisories & Consumption Guidelines. Trout Lakes: 5 per day, 3 daily limits in possession. Streams: 2 per day, 3 daily limits in possession. Angling restricted to artificial flies and lures in streams. See Exceptions where use of bait is allowed. Only 1 trout over 20 inches in length may be taken per day. Rainbow trout over 20 inches are considered steelhead in streams. Salmon under 15 inches are considered trout, except coho salmon, which are always considered salmon regardless of size. Kokanee included in trout limits unless noted under Exceptions. No limit on size or number of brook or brown trout in streams unless noted under Exceptions. Closed to angling for bull trout unless noted under Exceptions. Salmon and Steelhead In the aggregate: 2 adult salmon or steelhead per day, 20 per year. 5 jack salmon per day, 2 daily jack limits in possession, with the exception that one additional hatchery steelhead may be retained per day for a total aggregate of 3 adult fish harvested daily. Closed for coho salmon, except as listed under the Deschutes River and hatchery coho salmon as listed under Eagle Creek, Herman Creek and Hood River. Only hatchery steelhead may be taken. 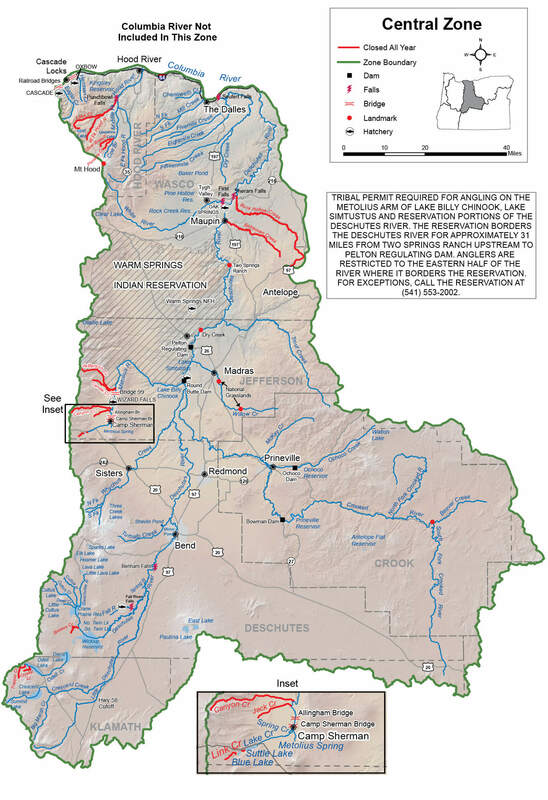 See Exceptions in Central Zone under Deschutes or Hood River basins to determine where harvest of Chinook and coho salmon is allowed. Harvest of wild steelhead is not permitted in the Central Zone. There is no annual limit on hatchery salmon or hatchery steelhead so long as the appropriate number of Hatchery Harvest Tags have been purchased to record the catch. Note: Changes to salmon regulations for the Columbia River system are available online at myodfw.com. Check regulations before you fish. Closed in all waters unless noted by species under Exceptions. Sturgeon may not be removed from the water and must be immediately released unharmed. Only one single-point, barbless hook may be used for sturgeon. Streams: Open during trout, salmon or steelhead seasons. Largemouth and Smallmouth Bass 5 per day, 3 daily limits in possession. No more than 3 over 15 inches in length. Streams: Open during trout, salmon or steelhead seasons only, except portions of Columbia River tributaries flooded by Bonneville and The Dalles dams are open all year. Bluegill, Catfish, Crappie, Other Sunfish, Walleye, Yellow Perch, Whitefish, Sucker, Northern Pikeminnow, Carp, Chub, Sculpin and other Nongame Fish No limit. Angling restricted to artificial flies and lures in streams. See Exceptions where use of bait is allowed. All trout, salmon and steelhead that are released must be unharmed and should not be removed from the water.